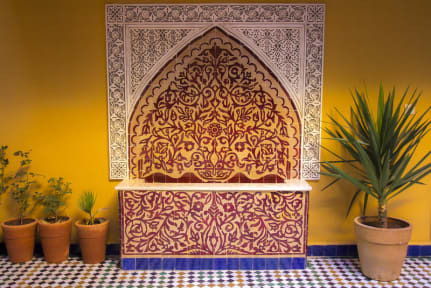 Medina Social Club is a friendly new hostel located in the heart of the Fes Medina. The hostel is set in a beautifully renovated Riad, the Medina Social Club Hostel is looking forward to welcoming you. Free breakfast is served daily, a delicious traditional Moroccan is served in our restaurant. If you are curious and want to discover the surroundings, we organize taylor-made excursions with trusted drivers with a guide. Free Wi-Fi access is available and you will find a 24-hour front desk. We welcome artists in residency and also hold cultural events of all sorts. Our guests can attend for free any of those such as concerts, exhibitions, plays, dance, debates … The cultural season is made possible thanks to the « Soleil de Fes » association. 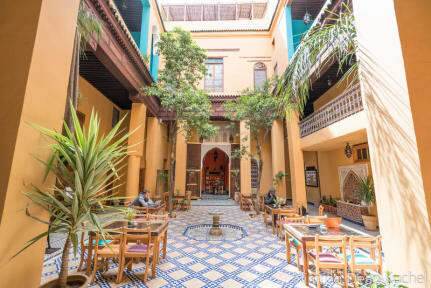 Medina Social Club is ideally located in the heart of the Fes Medina. The nearest airport is Saïss Airport, 15 km from Medina Social club. The hostel is located close to the main shopping area and all Medina attractions. Medina Social Club offers a wide range of private and shared accommodations. The hostel offers stylish private rooms from 1 to 5 people, all with private bathroom. All dorms are ensuite.